Polish mathematician and author; born at Lublin 1811; died at Warsaw March 22, 1887. He was a descendant of Moses Isserles, and, true to the family tradition, showed early ability as a Talmudic scholar. He later became familiar with Latin, German, French, and Polish, and made a special study of philosophy and mathematics. In the Hebrew periodical "Ha-Shaḥar," vol. iii. et seq., there appeared a series of Hebrew articles by Lichtenfeld which attracted attention. His reputation was enhanced by his series of articles, in the Polish periodical "Izraelita," on Jewish mathematicians. Lichtenfeld is known also by his polemics with Slonimski on mathematical subjects. 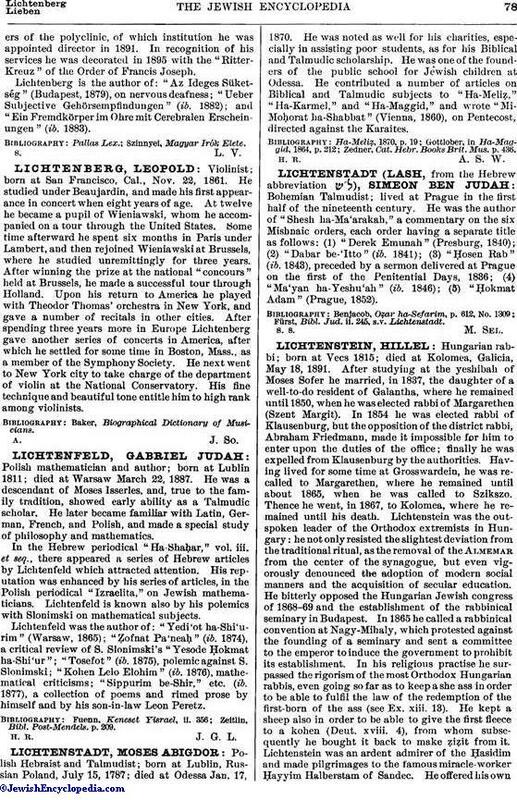 Lichtenfeld was the author of: "Yedi'ot ha-Shi'urim" (Warsaw, 1865); "Ẓofnat Pa'neaḥ" (ib. 1874), a critical review of S. Slonimski's "Yesode Ḥokmat ha-Shi'ur"; "Tosefot" (ib. 1875), polemic against S. Slonimski; "Kohen Lelo Elohim" (ib. 1876), mathematical criticisms; "Sippurim be-Shir," etc. (ib. 1877), a collection of poems and rimed prose by himself and by his son-in-law Leon Peretz. Zeitlin, Bibl. Post-Mendels. p. 209.